In the monthly Everyday Scholé series my friends, Sara & Chelli, and I have been discussing the eight essential principles of Classical pedagogy. We've talked about two of the maxims so far (Festina Lente and Multum Non Multa). This month we'll be tackling the next principle - Repetito Mater Memoriae. 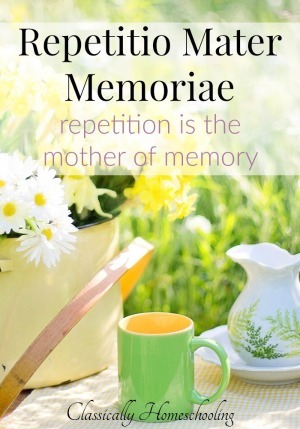 You're probably familiar with the phrase 'repetition is the mother of memory' (Repetito Mater Memoriae). There's a reason that phrase is known - because it's true. We learn best through repetition - repeating the same content in different ways solidifies it in our memory. Our usual teaching methods include plenty of time for teacher's lecturing students, which creates a very low rate of retention. Even worse, is the tendency to cram for tests, take the test, and forget everything you learned. There's no point to an education like that - where nothing is retained or considered important enough to remember. More creative and useful techniques are available to us - something that we, as homeschoolers, can take full advantage of. One method that works well in our home is a daily recitation time. Ten minutes each morning and an organized binder are all it takes to recite and memorize poetry, history facts, grammar lists, Bible verses, and Latin declensions. Memorization and recitation is a major part of our homeschool day, but only within the context of what we are learning. I disagree with the general philosophy of memorizing lists just for the sake of memorizing. If you are learning about ancient Rome, then memorizing a list of the first 20 emperors of Rome is fitting. But just to memorize a list of emperors without context is meaningless. When you include recitation and memory work as a natural part of other subjects, it creates meaningful connections - which produces a higher level of understanding. Our a daily recitation time gives us the perfect opportunity to review learned material or expand on what we've been learning about. It's very quick - only 10 minutes - but it makes such a difference in learning. Best of all, once the system is created children can work almost independently - freeing you up to work with other children, correct work, or tackle some much-needed housework. We keep a simple binder that's organized by things to recite every day (new material) and, as the material is memorized, it makes its way through the different sections of the binder (odd/even days, once a week, once a month, etc.) You can read more about our system in the post linked below. During this daily recitation time, you can practice anything that's related to what you're learning. We've tackled various history-related content (Presidents, rulers of England, Prime Ministers of Canada), Latin conjugations & declensions, Bible verses, poetry, grammar facts (parts of speech and definitions; prepositions; state of being and helping verbs), and even scientific facts (types of stars, systems of the body, and the planets, to name a few). This is just one example of putting the 'Repetito Mater Memoriae' principle into action. Another way to create connected learning is with the maintaining of a commonplace book. 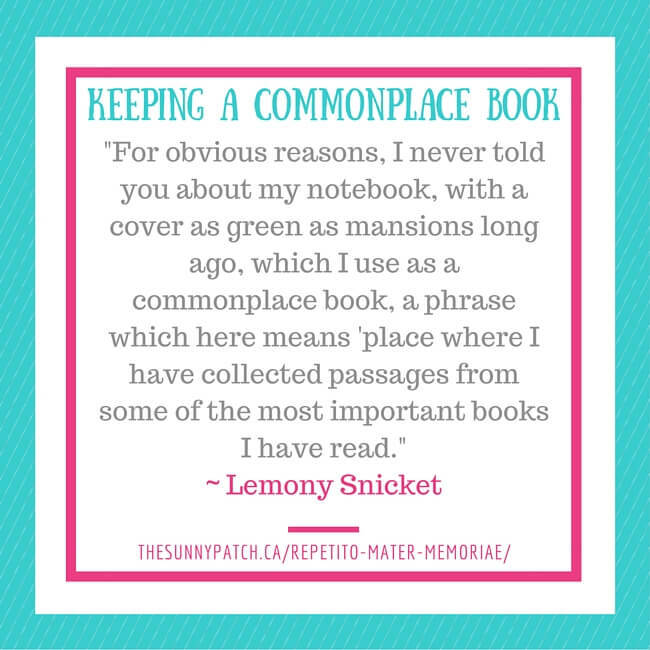 A commonplace book is a journal (a hard-covered exercise book works very well) simple tool to collect important information, thoughts, or facts. It can be filled with passages from books, poetry, prayers - really whatever you want. They were a very common tool for many historical figures (Thomas Jefferson, Ralph Waldo Emerson, Mark Twain, and Thomas Hardy). To use this simple tool in a homeschool setting each child needs a personal journal or notebook and time to write down passages, Bible verses, and poetry that are important to them. We've found this most useful during the middle school years when writing is easier (and I imagine we'll continue using commonplace books in high school too). I even keep one for my own reading. There are no hard-and-fast rules about keeping a commonplace book. Let your child personalize it and include the things that are most important and meaningful to them. It's simply another tool to create connections and context for learning. These two simple techniques - daily recitation and commonplace books - are not hard to implement. They are just simple tools that will help you create opportunities for deeper learning with your children. It's all about putting these classical education principles into action! If you want to learn more about this principle and how to apply it to your own homeschool experience, visit Sara atClassically Homeschooling and Chelli at The Planted Trees to see how they are applying the principle of Repetito Mater Memoriae with their children.